The Galapagos Islands off Ecuador have some of the best marine shows in the world for scuba divers. This historical site of over 20 volcanic islands is famous for its wildlife and marine life and is a key area for conservation efforts, making a Galapagos liveaboard trip an incredible experience for any diver. Most of the area is a national park where commercial fishing is banned, while 20% of the marine life is native to the area. The waters around the Galapagos Islands are rich in nutrients which make the underwater world thrive with life and activity. From whale sharks and rays to marine iguanas and hammerheads, the Galapagos Islands are one of the top rated scuba diving destinations in the world. To help find the right Galapagos liveaboard for you, we’ve put together this guide to show you everything you need to know to make the best decision. The Galapagos Sky’s 8 day itinerary may well be this region’s best value. 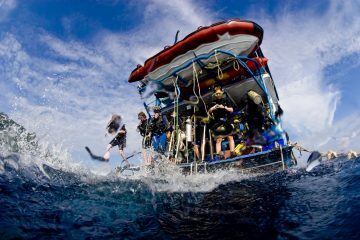 Diver-friendly perks like onboard courses, camera rental, and specialized services for families diving with children, make this an appealing choice for a wide range of guests. 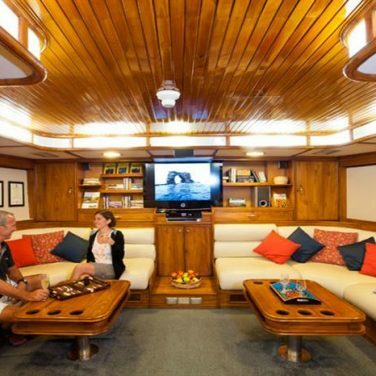 Fine dining, spacious common areas and cabins, and a top rated dive crew keep divers relaxed and well cared for both above and below water. This boat also offers a discount program for dive pro’s, military members, and repeat clients. 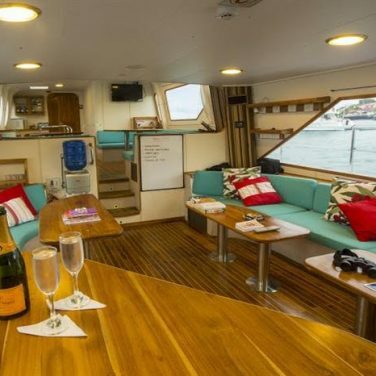 If you’re looking for luxury at sea, you’ll love the plush amenities available on this boat. 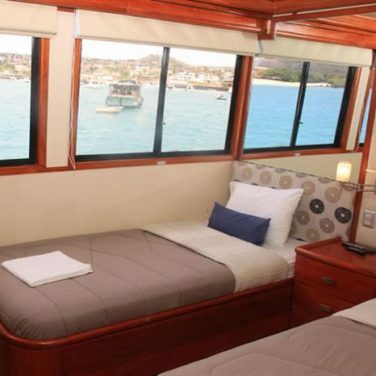 Creature comforts like an on-deck hot tub, chef prepared meals, and complimentary beer and wine, give this liveaboard the feeling of an all-inclusive resort. The Galapagos Aggressor III is also the region’s best option for underwater photographers. Modern and updated facilities for camera equipment are available, as are specialized photo itineraries, photography and videography courses, and one on one coaching with a photo pro. 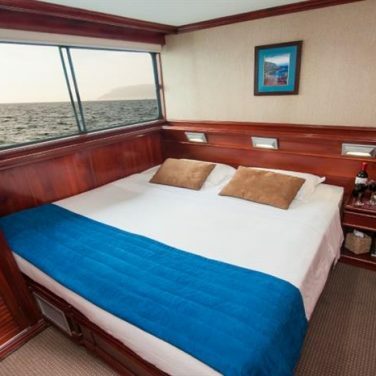 With only 8 guests onboard, the Nortada is this region’s most intimate liveaboard. 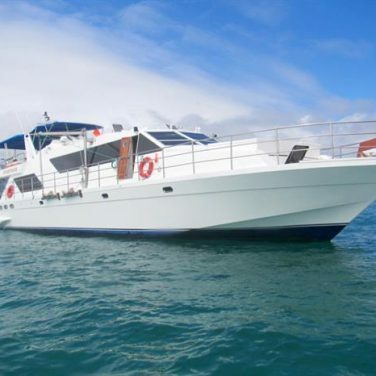 A popular choice for dive groups and chartered trips, this boat is a perfect pick for your dive vacation with friends or family. 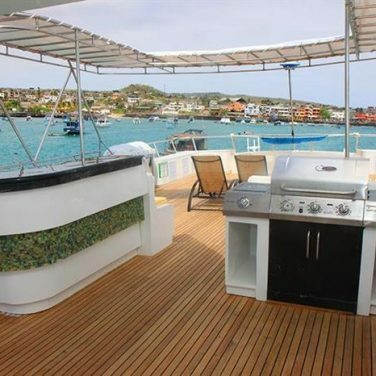 And, this vessel caters to divers of every experience level. Whether you would like to add Nitrox, support for technical diving, or even rebreather diving to your itinerary, the crew has you covered. 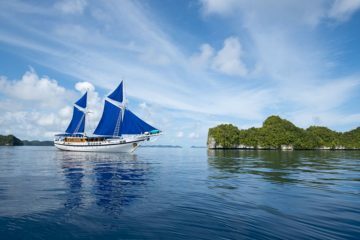 With a 20 tank guarantee and multiple shore excursions, 8 day voyages on this liveaboard are an excellent value, too. 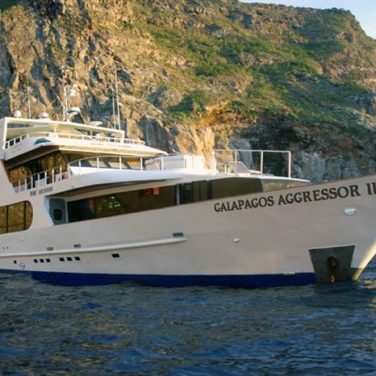 For experienced divers with time on their hands, an 11 day voyage on this liveaboard is the ultimate Galapagos diving experience. These long-haul trips stop at all the best dive sites in the archipelago, plus a handful of remote and less visited spots throughout the region, too. 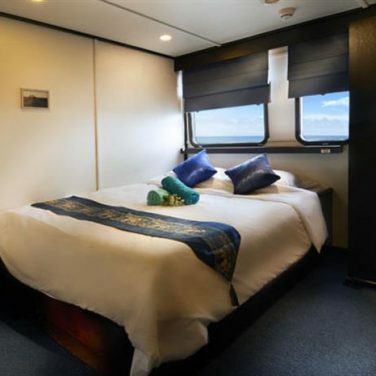 Highly praised meals, spacious cabins and common areas, and plenty of exciting shore excursions make it easy to relax in between dives, even on an extended itinerary. 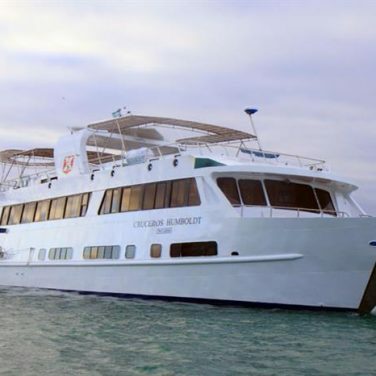 One of the most spacious and comfortable boats in The Galapagos Islands, the Humboldt Explorer is a top pick for groups with non-divers, and families traveling with children. 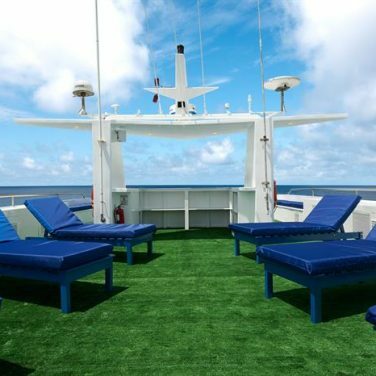 You’ll find plenty of space to stretch your legs between dives, with large sun and shaded decks to choose from. 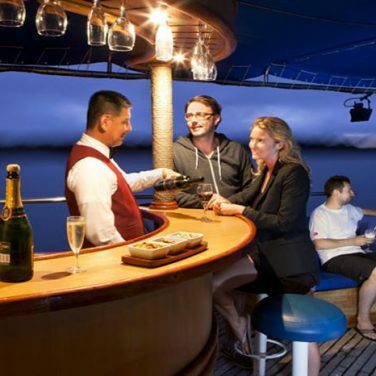 Onboard perks like a hot tub, comfortable air-conditioned common areas, complimentary beer and sodas, and special activities for snorkelers, are sure to keep above-water only guests well entertained, too. Advanced. The Galapagos Islands top most divers bucket lists, but a trip to this region isn’t for everybody. You can expect challenging surface conditions, strong currents, and low temperatures at most dive sites. Many operators require their guests to have experience diving in a current, advanced certification, and 50 logged dives. 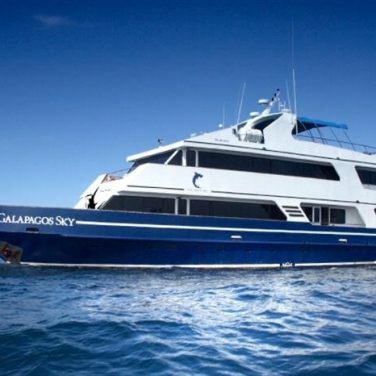 7 to 11 days If you’re planning a liveaboard in The Galapagos Islands, you’ll want as many dive days as possible. Traditional 8 day itineraries offer around 20 tanks and one or two shore excursions. Serious divers and underwater photographers should opt for longer adventures lasting between 10 and 14 days at sea. The extra time underwater is well worth it in this thrilling dive destination! The Galapagos Islands are a year-round dive destination, and what time of year is best depends on who you ask. Most divers agree that the rainy season is more exciting thanks to schooling sharks, hammerheads, and playful sea lion pups. But, colder months attract large numbers of whale sharks. No matter when you visit, you’re certain to spot plenty of big fish! Weather in The Galapagos Islands varies seasonally. From January through June, overcast skies and daily showers are typical. You can expect warmer water, between 68 to 82° F (20-28° C) and most divers are comfortable in a 5mm wetsuit. Dry season brings colder conditions both above and below water. Ocean temperatures range from 61 to 73° F (16-23° C) making a 7mm suit, hood, and gloves more practical. Pack for cold and windy nights at sea year round. Just like the weather, water clarity in The Galapagos Islands varies by season. From January through March, visibility reaches 98 feet (30 meters). During other months, plankton blooms cloud the water, sometimes reducing visibility to only 16 feet (5 meters). This influx of food also attracts higher numbers of manta rays and whale sharks. One of the planet’s most unique destinations both above and below water, The Galapagos Islands are sure to dazzle even the most experienced liveaboard diver. An endless parade of massive pelagics, thrilling drift dives, and weird wildlife await visitors to this Pacific wonderland. Best of all, strict park regulations keep visitor numbers low and dive sites uncrowded. Above the waves, strange creatures wander the archipelago’s stark volcanic landscape. Giant tortoises, lava lizards, snakes, and flightless seabirds are frequently encountered during hikes and shore excursions. Many of these fascinating photography subjects are found nowhere else on earth. Beneath the crash of the Pacific, these waters are a haven for big fish. Depending on the season, you can expect to see schooling sharks, manta rays, hammerheads, whale sharks, and even the elusive mola mola. Protected coves throughout the archipelago present opportunities to dive alongside playful seal and sea lion pups, penguins, and ocean-going iguanas. If you’ve had your fill of big fish, have no fear. Fascinating macro subjects like batfish, seahorses, and nudibranchs are found in The Galapagos Islands, too. Thanks to cooler water and blooming plankton, your best chances of spotting a whale shark are between July and December. But, lucky dive groups might encounter these gentle giants at sites like Darwin Island and Wolf Island all year round. The sharks visit these deep-water cleaning stations for a good scrub down, and a break from the intense currents of the Pacific Ocean. One of the greatest thrills while diving in The Galapagos Islands is a chance to swim alongside schooling sharks. Galapagos, white tip, and silky sharks are among the species most commonly seen. Dive sites around Isabella island offer the best chances for up-close encounters. But, in this region, you should expect the unexpected! Keep your eyes on the reef’s edge and out in the blue, and you might glimpse of these graceful predators traveling en masse. The North Pacific is famous for its manta ray sightings. 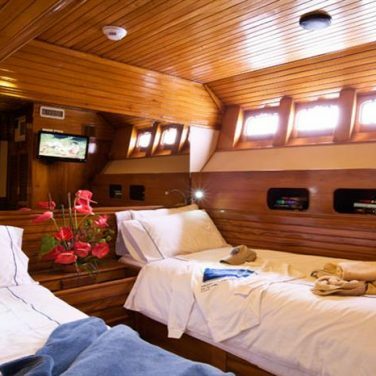 And, liveaboard divers in The Galapagos Islands won’t be disappointed. During their peak season, from January through May, encounters are nearly guaranteed around the islands of Darwin, Isabella, and Wolf. The chances are good that you’ll spot mantas relaxing at cleaning stations or cruising in the current at the reef’s edge. But, keep your eyes up, and you might catch them passing close overhead or out in the blue during your safety stops. Hammerhead sharks are among the most sought-after wildlife found in this region. During warmer months, lucky groups of divers can spot these shy and elusive predators visiting cleaning stations and prowling the reef’s edge. Some central dive sites, like Gordon’s Rock, attract large numbers of hammerheads, often schooling together in groups of 10 or more. But, lone sharks are commonly encountered at the islands of Wolf, Darwin, and Isabella. Some of the planets weirdest and most wonderful wildlife calls the Galapagos Islands home. And, many of these species are found nowhere else in the world. Galapagos penguins and sea lions are some of the region’s most playful inhabitants. Spring months are best for spotting these rare animals feeding and frolicking in the surf. A favorite among photographers, marine iguanas are found here, too. Typically found in shallow water feeding on algae, these oceangoing reptiles can only hold their breath for a few minutes at a time. So, you’ll have to be quick on the trigger! Far stranger creatures thrive below the waves here, too. One of the area’s most fascinating examples, the red-lipped batfish, looks like a work of pure science fiction. The equally bizarre mola mola or giant sunfish is an uncommon find, even in The Galapagos. Two species of sunfish live in the archipelago, but these mysterious animals are only seen when they surface to bask in warm water. 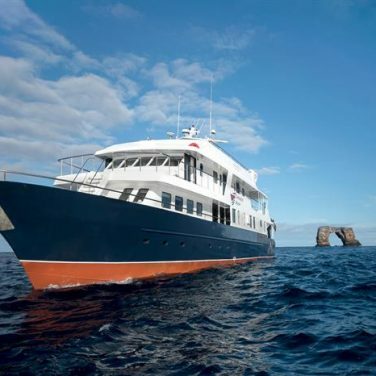 No matter what Galapagos Islands liveaboard you choose, you’re sure to go ashore for some exciting excursions. Popular stops include a visit to the Charles Darwin Research Station, hiking to spot resident giant tortoises on the island of Santa Cruz, and birdwatching on North Seymour Island. If you have a specific land destination in mind, be sure to inquire with your liveaboard operator well in advance. Strict park regulations and permit requirements determine which boats go where. There is no such thing as too much time underwater in The Galapagos Islands. Every dive is an adventure, and in this region, the longer your trip, the better your chances of some incredible underwater encounters. Many of the best dive sites are far removed from the rest of the archipelago, taking up to 16 hours to reach by boat. But don’t worry, the journey is well worth it. We promise! The diving in these remote waters is some of the best in the world. Most operators offer an 8 day adventure through the archipelago, which translates to 6 full days of diving. These classic itineraries stop at all the best sites in the region and typically include 2 shore excursions. 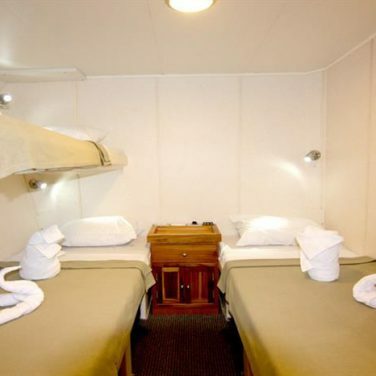 You can expect 3 to 4 tanks per day no matter what liveaboard you choose. So, pack plenty of exposure protection, especially if you are diving during the dry season. Longer voyages with up to 11 days at sea are a good fit for underwater photographers and serious divers. These trips stop at all the same sites as traditional itineraries. But, they spend up to 2 days in some of the region’s most thrilling spots. With up to 8 tanks at the islands of Wolf and Darwin, you’re sure to spot all of the most famous species in the archipelago. Extended expeditions usually offer an extra shore excursion, too. 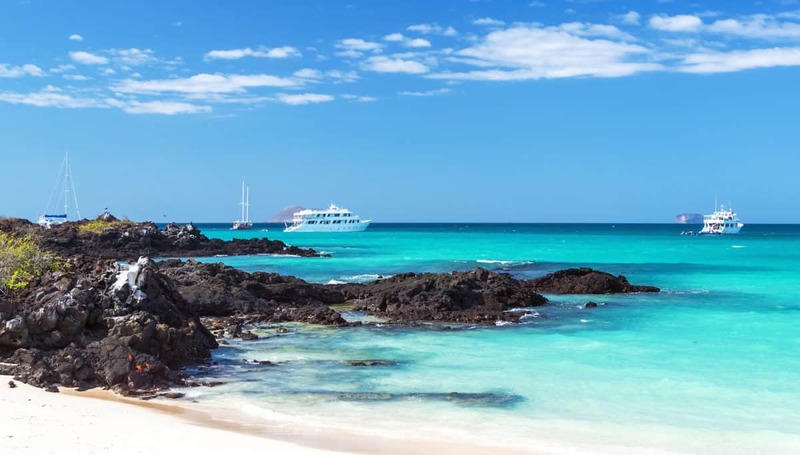 If you’re planning to spend more than a week at sea in The Galapagos Islands, you’ll want to plan and pack for the region’s remote location. Underwater photographers should bring plenty of batteries and backup equipment. 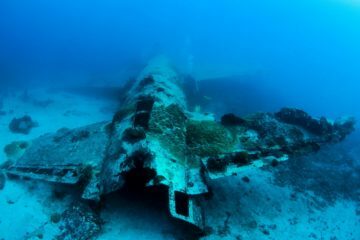 And, all liveaboard divers should prepare themselves for rough ocean conditions. Found in the far northwestern reaches of the archipelago and only reachable by liveaboard, darwin island is the most famous place to dive in the galapagos islands. Easily recognized above water thanks to its stunning arched rock formation, this island is visited by every boat in the region for at least one full day. And, many stick around for longer. Photographers should plan for a 4 tank long wide-angle adventure featuring schooling hammerheads, manta rays, galapagos sharks, and even the occasional whale shark. Darwin island is prone to strong currents, colder temperatures than the southern archipelago, and unpredictable surface conditions. Southeast of Darwin, Wolf Island promises equally impressive diving. Sites like Shark Bay, Landslide, and The Caves, are home to a stunning variety of megafauna. Galapagos sharks, mantas, eagle rays, bottlenose dolphins, hammerheads, and whale sharks, cruise in strong currents on the reef’s edge. And, this island is home to a rookery of friendly sea lions. Spring months are best for interacting with and photographing the boisterous pups. But, you are much less likely to see a whale shark during these months. Like Darwin Island, dive sites here are subject to powerful Pacific currents and open ocean conditions. This island is home to many excellent dive sites, all known for up-close encounters with sharks and rays. Redonda Rock is famed for its volcanic fumaroles, which stream bubbles of natural gas from deep beneath the earth’s crust. This warmth attracts multiple species of nudibranchs and other macro life uncommon elsewhere around Galapagos. Silky sharks, hammerheads, and Galapagos sharks frequent this site as well and are often encountered while dive groups are on their safety stop. Nearby, Cabo Marshall is one of the region’s best places to spot manta rays feeding and waiting patiently in line at busy cleaning stations. Though Fernandina is less frequently visited than its larger neighbor, Isabela, the island is home to some exciting dive sites. The shallows around Cape Douglas are your best bet for diving alongside the archipelago’s famous endemic penguins. These fun, flightless birds spin and twirl through the ocean as they hunt for small baitfish. Video is best for capturing these high-speed encounters. Sea lions and fur seals frequent these same waters too, searching for food and shelter in Fernandina’s many protected coves. Unlike other parts of the archipelago, dive sites around Santiago feature a backdrop of boulders, encrusted in hard and soft corals. Thanks to all that coral cover, Cousin’s Rock is home to the most exciting variety of macro life in the region. Photographers should plan for at least two tanks of smaller than life action, with nudibranchs, frogfish, batfish, and seahorses on display. There are plenty of big fish around Santiago, too. Large groups of spotted eagle rays, Galapagos sharks, sea lions, and schooling barracudas make surprise appearances on nearly every dive. These central Galapagos islands host a variety of well-known dive sites, visited by every liveaboard in the region before heading north to Wolf and Darwin. Which ones you visit will depend on your boat’s timeline, budget, and the experience level of your fellow passengers. Less challenging dive sites between the two islands are great for introduction dives at the beginning of the trip. Schooling reef sharks, Galapagos sharks, and even the occasional hammerhead make an appearance at these otherwise unremarkable boulder-strewn sites. If you’ve brought camera equipment along, this is the place to set up and test everything. Nearby Gordon’s Rock is the most visited central site in the archipelago. Nicknamed “the washing machine,” this dive spot is home to unpredictable currents and surface conditions. Below water, hammerhead sharks are the stars of the show. Large schools silently cruise out in the blue and scour rocks along the edge of the reef looking for an easy meal. Mobulas, reef sharks, and Galapagos sharks patrol the dropoff, too. The calm waters outside Acadamy Bay, Santa Cruz, are a favorite among photographers. Batfish, seahorses, and feeding marine iguanas make for exciting photo finds.